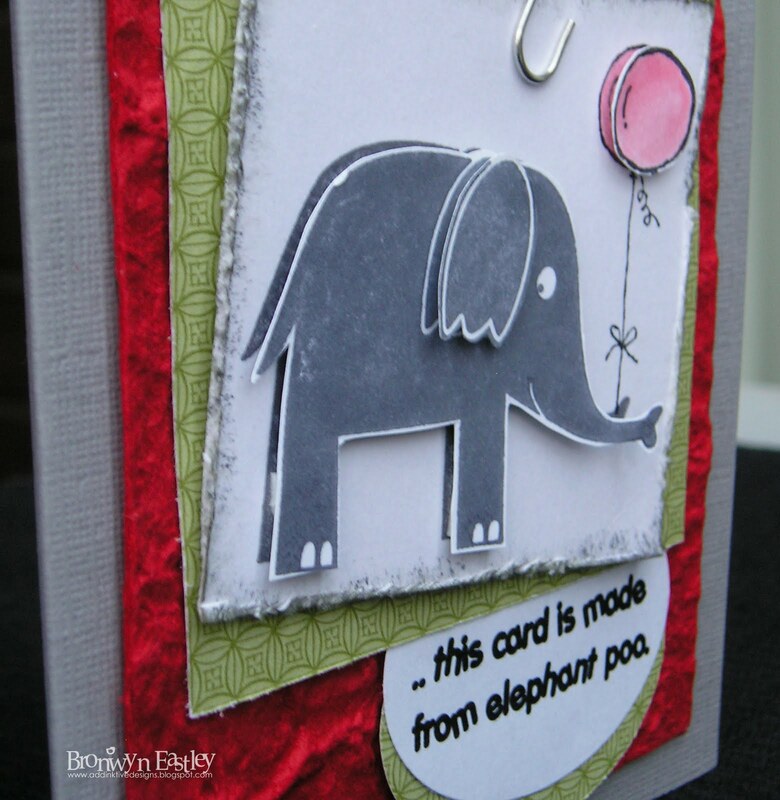 There's a real sweet reason to make this card today and it comes in the form of a dear lady called Betty! More about that story at the end of the post. The second reason is that I love doing Makeesha's challenges and she has put out a colour challenge for this week. 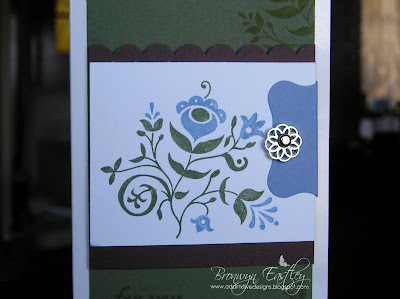 I got to use the last of some Real Red card stock from my original stash, break open the 'Taken with Teal' Stampin' Pad and use its accompanying card stock for the first time! Not to mention that I also got to use some retired DSP that I was wondering if I'd ever get to use again. So, as you can tell, this one got me out of my 'comfort zone' and got my mind ticking over at full speed. It's a shame I don't have a housework fairy who does the washing, cook the tea and write my school reports! 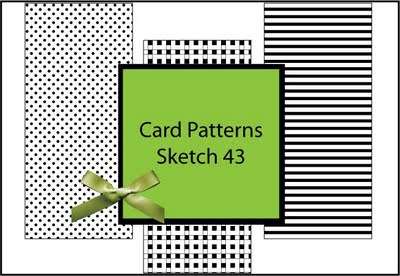 The third reason is that I got to have a go at a sketch challenge from 'Card Patterns' that I have wanted to participate in for a while. So I've combined two challenges for the first time. 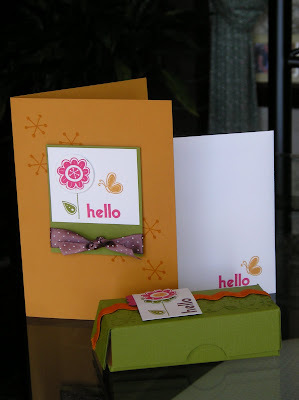 The fourth reason, not that I need any more reasons to make a card, is that it gives my customers a sneak peek at something new in the Summer Mini and fifthly, I got to have a play with my new 'Something Sweet' stamp set for the first time. Sixthly ... my daughter, Laura, wanted to crack open the huge packet of Jelly Belly, Jelly Beans that I had bought especially to use with this stamp. The packet had 49 flavours ... and yes it was fun trying to find the colours to match the challenge - flavours being, Red Apple, Orange Juice, Berry Blue and French Vanilla. Yum! What funky colours, just right for the Gumball Machine! 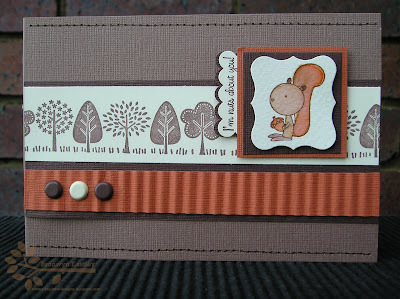 I turned the sketch a full 90 degrees as it suited the stamp set that I wanted to use. Back to Betty ... she's a very lovely lady who faithfully comes to church and gives the younger children a lollypop every week! When my kids were little, they affectionately called her, 'The Lolly Lady'. Now they are both teenagers (19 and 16) but she still chats away to Laura and one day she offered to knit her a scarf. Betty knows how much Laura loves scarves and this morning she gave her a present all wrapped up in Chrissie paper. Inside were two scarves, one she had knitted and the other was a blue silk one all the way from Bali. Her son has a clothing business there. What a special lady! 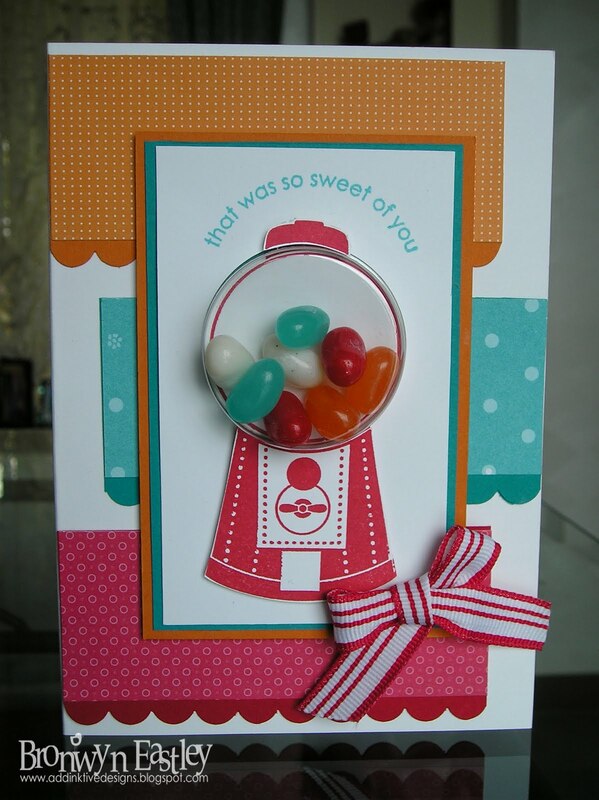 I thought it was very appropriate to make a card with lollies on it, so Laura could say thanks. I'm off now to write some more reports, well ... after I feed my 'hungry' family! I put together some little gift bags for a fundraising 'Car Boot Sale' that was held this morning. We all ended up sheltered in 'The Ark' safe and sound away from the pouring rain and thunder! Wow! Did the weather play up or what? Not to worry, as it was rather pleasant inside the church building and I got to talk to a few lovely ladies that enjoyed card making too. 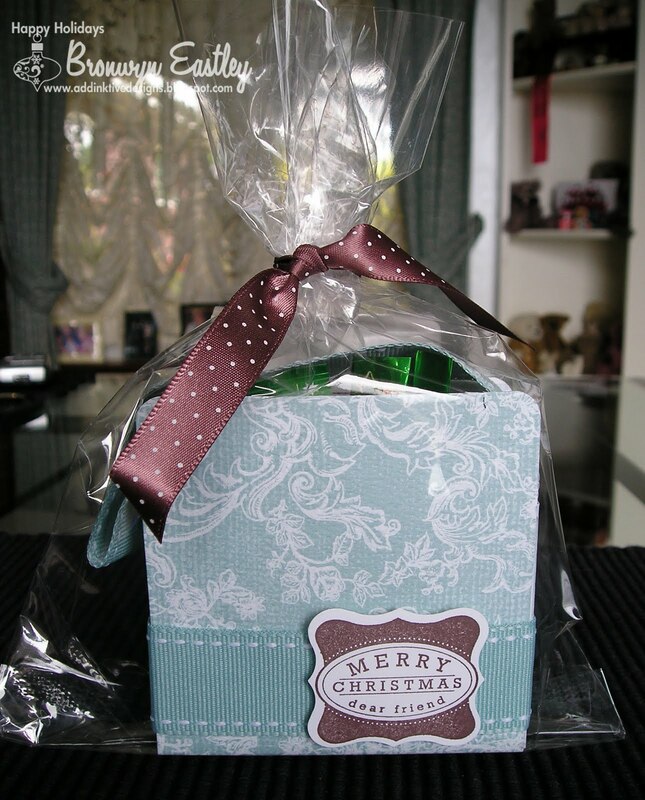 In this example I have turned a little note tote box into a little chocolate holder. I am still wondering how I can live without the Parisian Breeze DSP after December 1st clicks around. 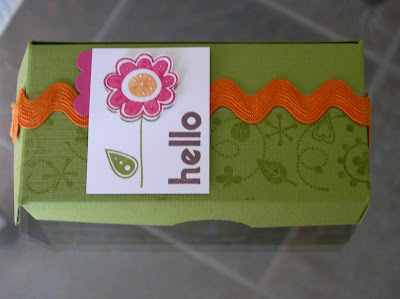 Accessories: Baja Breeze DS Grosgrain Ribbon, Ribbon Originals - Valet, Medium Flat Cellophane Bags, Curly Label Punch, Stampin' Dimensionals and Sticky Strip for the best double sided adhesive ever! These little gift packs are quick and easy. The Top Note Pattern is made from the Ski Slope DSP, which is then folded in half and stapled to the Medium Flat Cellophane Bags. 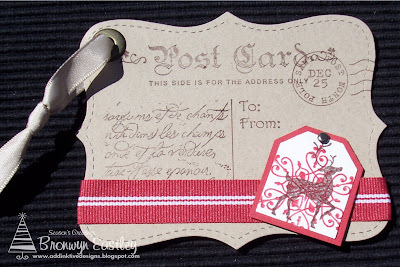 A stamp from 'Punches Three' (Hostess L1) is stamped onto Whisper White cardstock in Real Red, punched out with the Scallop Square Punch and attached with a Stampin' Dimensional. Voila! 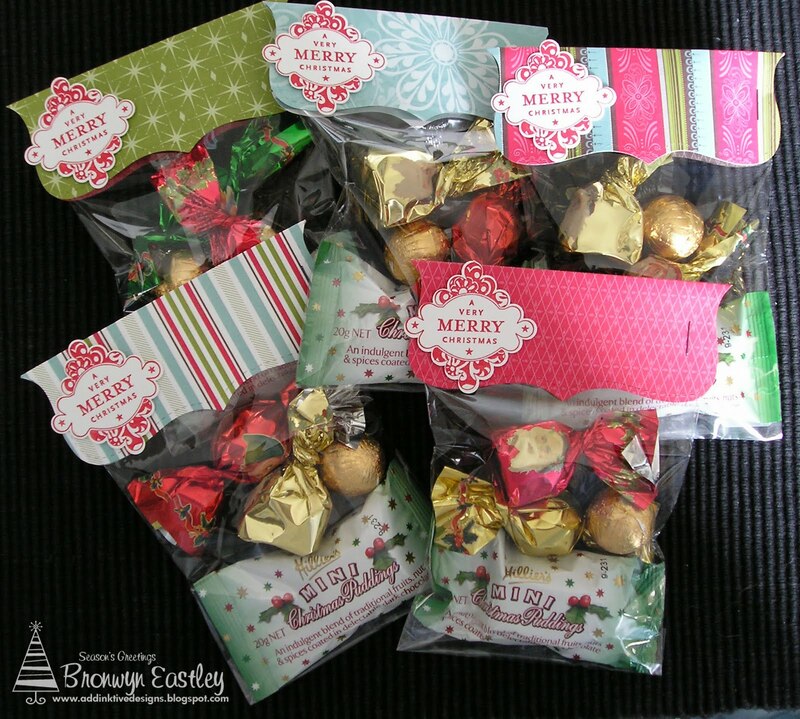 These would make very cute teacher gifts and we all know that teachers deserve to be rewarded with a present at this time of the year!!!! Cough .. cough .. 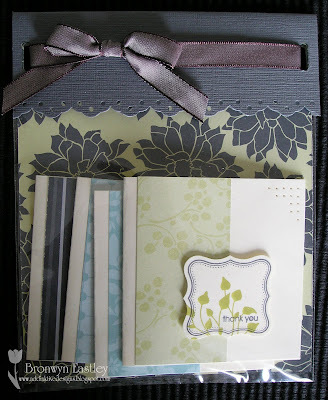 I have used this sketch layout for a few 'Love Notes' as it is such a simple and quick one to whip up. 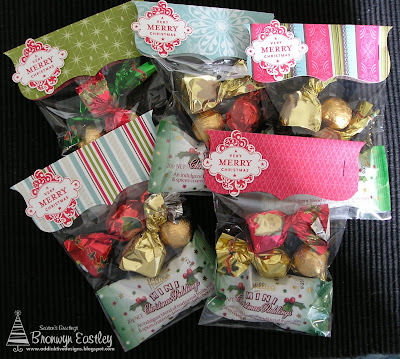 Some of you that drop by will remember these little gift bags from Caz B's Workshop. I did a special Make'n'Take that night, as her birthday was coming up. I recently finished putting together the packs that were left over and took them along to the Fundraiser I attended today. I won't post all the 'deets' except to say that I used Urban Garden DSP which I had already 'eyed off' in the American catalogue before it made its debut in Australia. So glad it came our way! Well, this is the first of three posts for today. Hope you enjoy browsing through my ramblings! Well, I've had an interesting week at work and I was in the middle of busily preparing gift packs for a fundraiser/car boot sale at church tomorrow (Trevallyn Life Church), when I thought I had better leave my craft room and come inside to make some lunch! While the quiche was cooking, I just had to have a sneak at Makeesha's sketch challenge to see if the results had been posted. Honestly, I was taken back! It was a lovely way to end the week. I work four days a week and have been in an Acting Principal role for the last two weeks. I love my job, but gosh it has been a 'growing' time for me. I love to spend Fridays creating and today, the word 'creating' is synonymous with the word, 'de-stressing' (If there's such a word). Even though 'winning' gave me a buzz, I was more excited and proud of my gorgeous son, who just received his first year Uni results today. Well done Ryan! Our family is truly blessed. Congratulations to the 'Honourable Mention' - Carole'Anne. Her snowmen card, with shimmery paint and glitter, is absolutely gorgeous. 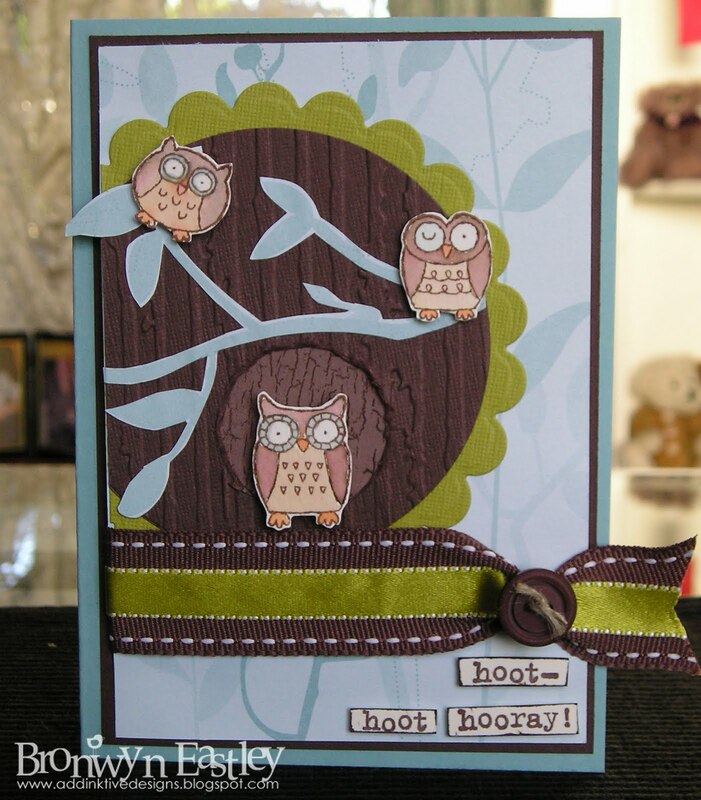 Pop into Keesh's site and have a look at all the wonderful entries for the week! If I survive tomorrow's 7.30 am start, I'll be back with a posting later in the day to show you some of the gift packs I made. It has been a lot of fun figuring out what to do with this new sketch challenge. 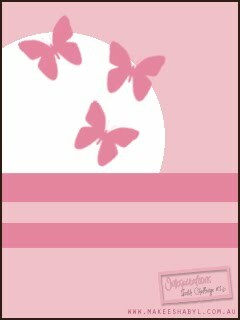 When I saw Makeesha's gorgeous example to go with the challenge, I was so keen to get out my new butterfly stamps and punch (available in the Summer Mini from Dec. 1st). Instead, I thought I'd try something a little different. However, I'm definitely going to make a similar card with butterflies, before the week is out! This is my third challenge for Makeesha and I must admit, they are becoming a highlight for me and somewhat of an addiction (in a good way). At least my friend, Leonie (from Calder) will eventually get a card for her birthday! I realised today that I had missed it ... oops! 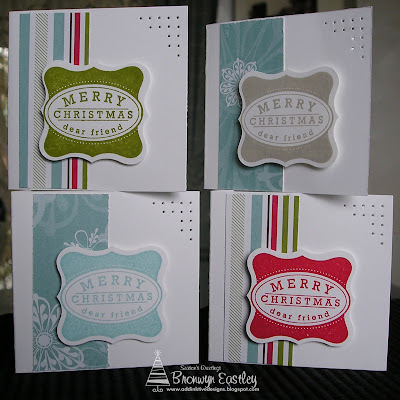 Stampin' Sisters in Christ have introduced a new challenge for the week, based on the verse from Galatians 6:9. The US is currently celebrating a week of Thanksgiving, but here in Australia we have a National Day of Thanksgiving where we honour different groups in the community. The first year it was introduced (about 5 years ago), they recognised and thanked teachers for their contribution. A local church hosted a breakfast for all the teachers in Launceston. It was a wonderful gesture and much appreciated. 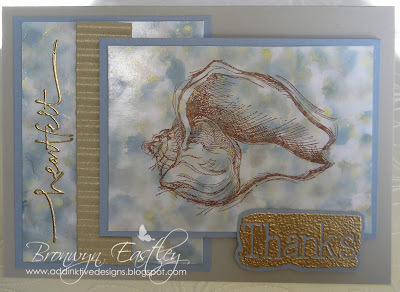 Well the challenge was to make a card or project that was about Thanksgiving or that expressed thanks. I decided to enter a card that I recently made for a technique demonstration on polished stone. Please consider this a big thank you to those that stop by and browse at my blog. It is much appreciated. 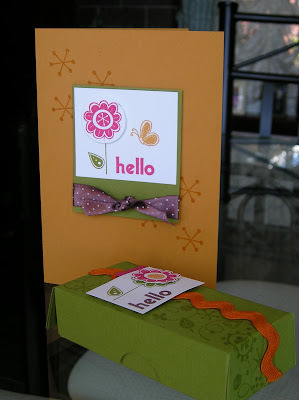 On a rainy Saturday afternoon, I set myself a challenge to use two of my new dies and to make some cards just using scrap pieces of cardstock. I had to find pieces large enough that complemented each other and that had matching taffeta ribbon! My favourite combo at the moment is Baja Breeze, Chocolate Chip and Kraft. Sadly, I didn't have scraps large enough for that combination but found some other favourites along the way. 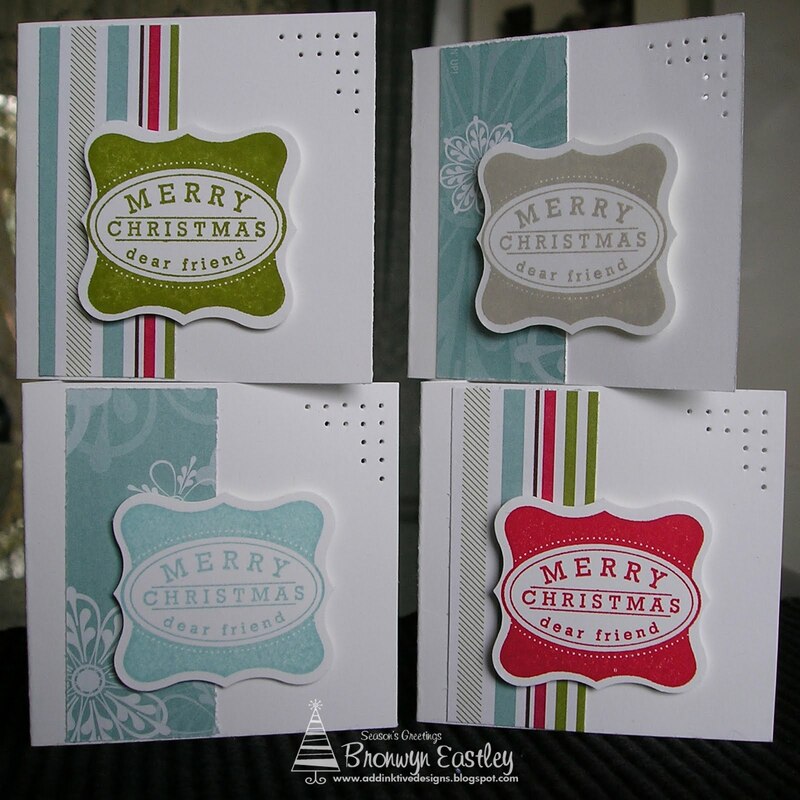 Stamps from Pocket Silhouettes were used for all four cards. I was also looking at ways to make some quick cards for the Car Boot Sale, which will be held next Saturday at Trevallyn Life Church. It's a fund raiser for the team going to Cambodia next year. Hope to see you there! I'd love to hear about what your favourite colour combinations are. Drop me a comment and let me know! One of the best things about being involved in Stampin'Up!, is that I get to take the techniques I learn, into my classroom at school. 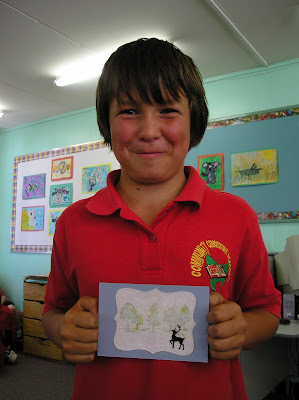 I get to play with stamps, with an enthusiastic bunch of wonderful children in my class! What more could a 'crafty' gal ask for? They had a play with the 'Acetate and Tissue' technique, which I discovered in the resources section of Splitcoaststampers. You can view the tutorial here. Yes, I really did do this all by myself and I get to appear on Mrs. Eastley's Blog (with Mum's permission of course!). Keelin was a little camera shy but, not only is she sporting a fabulous new haircut, she's also got a very cute piece of artwork to share with us. This one belongs to Donovan, who didn't want to appear on camera. He decided to make his into a Christmas Card. I wonder who will be blessed to receive such an awesome card? The grade 5's and 6's got to make their own photo frames in Tech, with Mr. Green, so many of the children's work will end up proudly displayed in them. 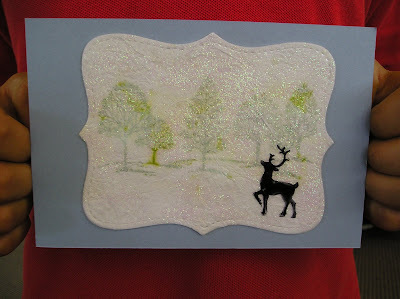 The stamps used were, Lovely as a Tree, Winter Post and Forest Friends. 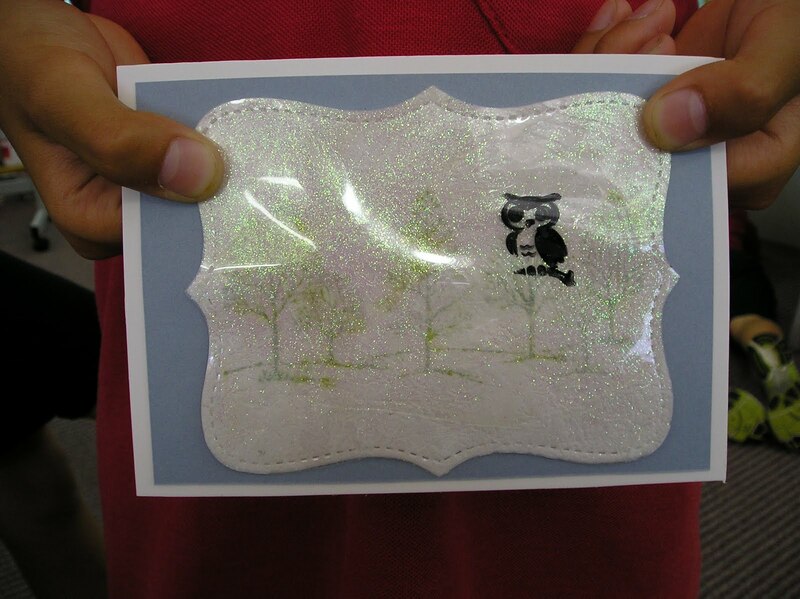 Children used Dazzling Diamond's Glitter with Crystal Effects behind the acetate (OHT sheets). Old Olive was used to stamp the trees and either, Bordering Blue or Baja Breeze re-inkers were blended into the Crystal Effects. Black Stazon ink was used to stamp the animals onto the acetate. All work was backed with either, Old Olive or Bordering Blue Cardstock. Haven't they done a wonderful job? Until next time ... enjoy this fantastic warm weather that Tassie is 'turning on' at the moment. Hubby is in the Hunter Valley for a work conference and I think we've got weather to match! 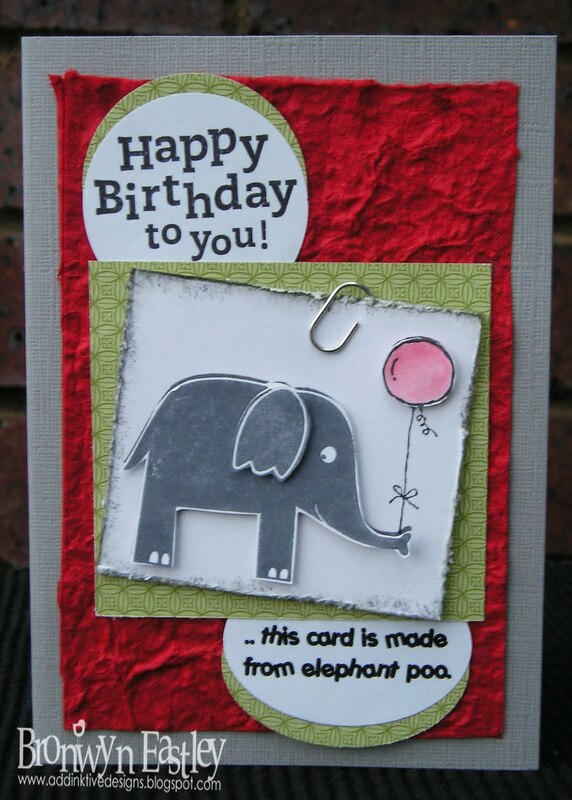 Happy Birthday to You .. this Card is made from Elephant Poo ! I had so much fun making this card (After a spot of Report writing first, as one has to get their priorities right!). The lovely Jim (our Business Manager at work) and his daughter, Victoria, have recently come back from a Mission's trip to Thailand. They know that I LOVE to make cards and brought me back two rolls of handmade paper made from ... elephant poo! How awesome! I couldn't wait to make something with it. There will be more creations to follow, as I can guarantee they will be a hit in the School Office! 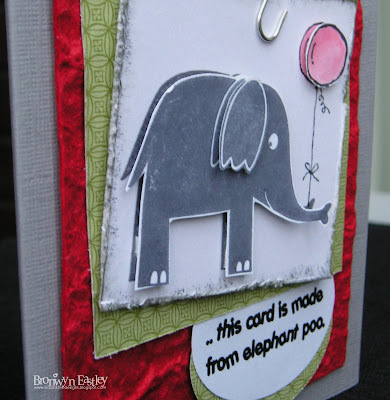 Cardstock: Going Gray (textured), Whisper White and Red Elephant Poo Paper! Results have just come in for Makeesha Byl's Colour Challenge for the week and, as I commented on her blog, I'm a little speechless right now! You can view the results here and check out all the other gorgeous creations in her slideshow! Had better come down to Earth, stop doing a happy dance, get off the Internet and go and cut some more cardstock for my Christmas Workshop tonight. Here's the final Christmas card - for now at least! I'm going to get stuck into planning for the launch of the new Summer Mini Catalogue, so my attention will shift in that direction for a while! 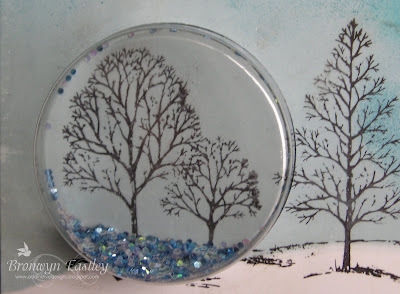 Did you love snow globes when you were a child? I certainly did. When I saw these cute little 'Sweet Treat Cups' in the Summer Mini, I wasn't thinking lollies, I was imagining a snow globe with Chunky Sprinkles inside for a very cool Christmas Card! So this morning I finally got around to making one. Yay! I'm happy when I get the chance to put on paper, what I picture in my head! Of course, I'm also pleased when I get to use the brayer and put a beautiful full moon in amongst the scenery. 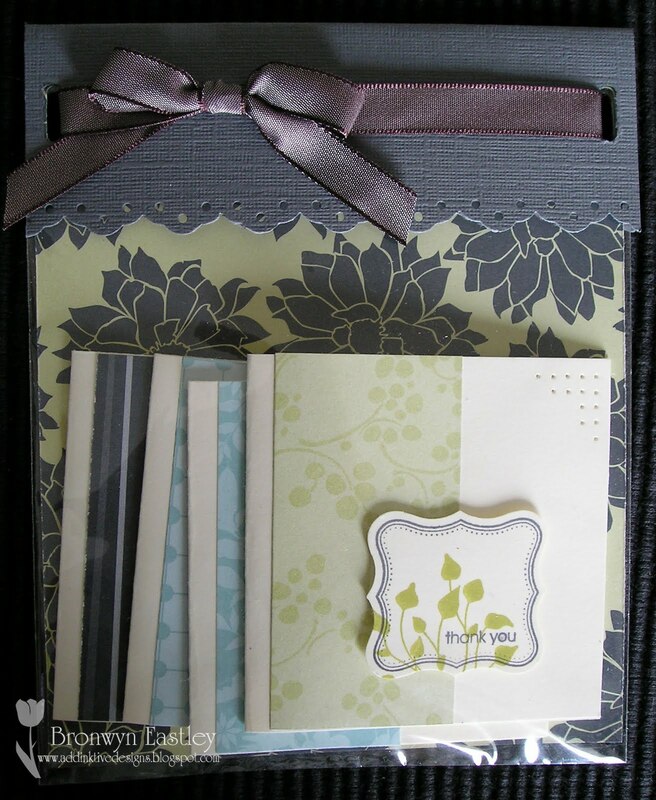 Cards with silhouettes would have to be my all time favourite ones to make, so I'm very content right now with the beautiful range of silhouette stamp sets that are currently available in the Ideas Book and Catalogue. A Close Up View of the Globe with Chunky Sprinkes Inside! 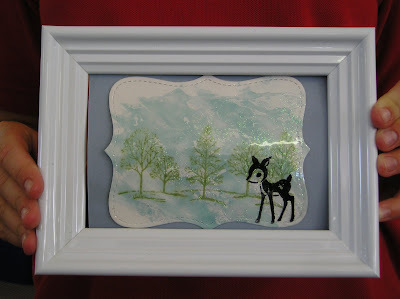 Firstly, I stamped the trees onto two post it (sticky) notes and cut along the top 'mounds' in the ground to form the areas that I needed to mask. I then punched out a 1 1/4" circle to form another 'mask' for the moon. I brayered (onto Glossy White cardstock) over the masked areas with Bordering Blue, then sponged a little bit of Not Quite Navy ink around the moon and along the top of the sky, before removing the sticky note masking. 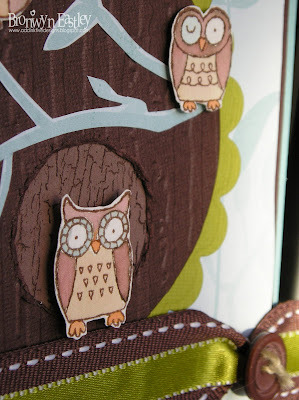 I then lined up the 'Lovely as a Tree' stamp set using the trusty Stamp-A-Ma-Jig and stamped it onto the scene using Basic Black ink. I punched out a hole using the new 1 3/4" punch, positioned the cardstock onto the Night of Navy backing and traced where the punched out piece would go. Light Blue and Crystal Iris Chunky Sprinkles were placed inside the Sweet Treats Cup which was then inserted through the punched out hole. The trees that had been punched out, were glued into place behind the 'globe'. 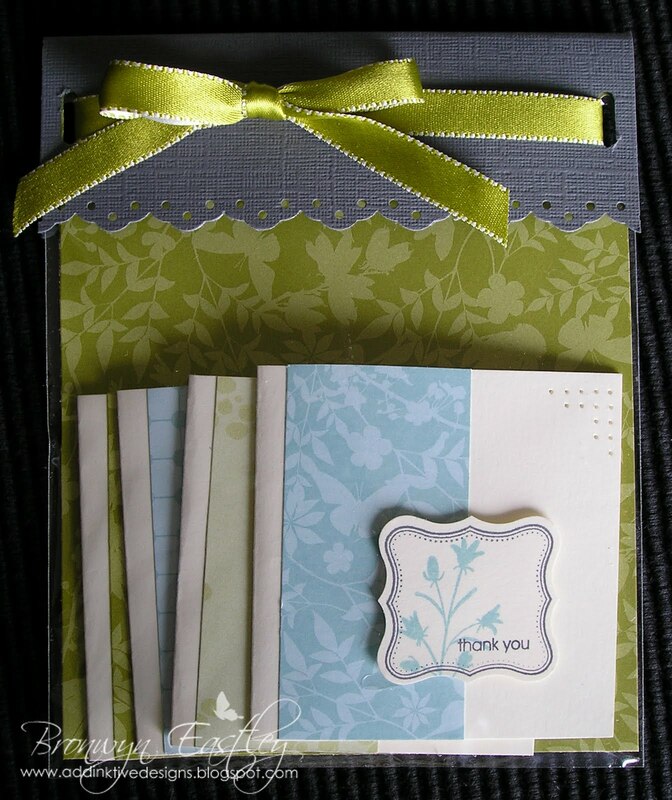 The two pieces of cardstock were adhered with Sticky Strip and placed onto the white cardstock with Stampin' Dimensionals. The greeting is from the Snow Swirled Set and that was placed underneath, using NQN ink. Well, if I'm allowed to say so .. I was pretty 'chuffed' with how it turned out. What do you think? Until next post .... which will probably be pictures of some lovely ladies getting stuck into their Christmas Card making, have a blessed day! 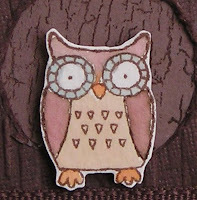 Here's number 3 and 4 in a series of 5, that we'll be making at my Christmas Card Making Nights. The first one is THIS Friday. 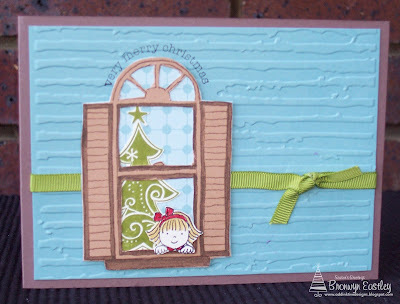 I had resisted buying the Ski Slope DSP from the Spring Mini until I saw so many beautiful Christmas cards made from it. You have only until the end of November to order from the range, so if you're interested in purchasing the DSP or any of the stamp sets and accessories, let me know before we have to say goodbye to Spring and hello to Summer! I deliberated over this layout for ages (still not 100% happy), but love the fresh, vibrant colour mix of Old Olive, Chocolate Chip, Really Red and Baja Breeze. Tree Trimmings got inked up for the first time, with me, and I just think the ornaments are among the nicest 'Christmasy' stamps I've seen! 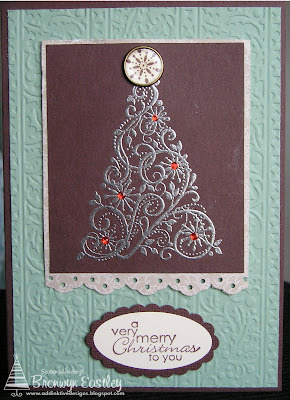 When I saw a card on Splitcoaststampers made from Chocolate Chip, Sage Shadow and Very Vanilla, I knew that I wanted one of my Christmas cards to have that 'yummy' combination. So here it is. I'm also pretty happy to have a chance to use a designer brad again! 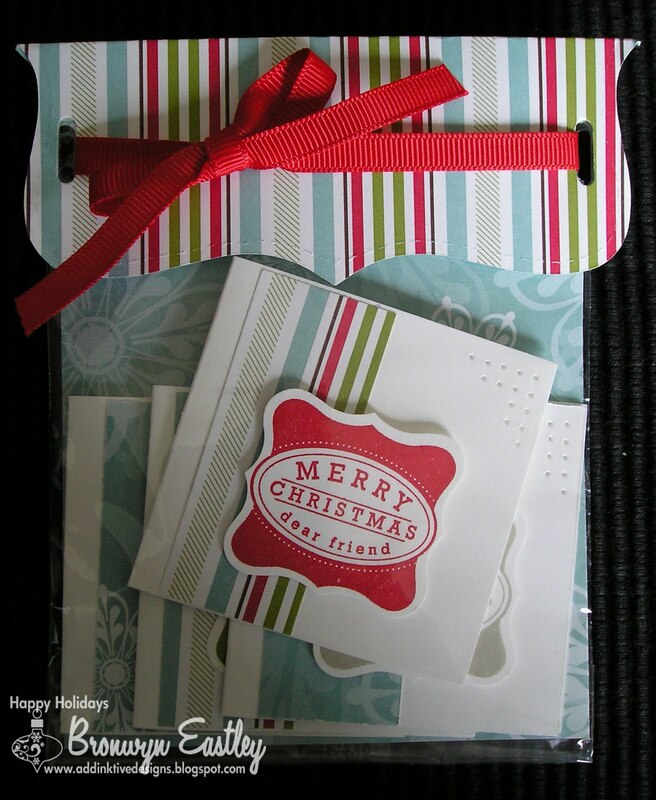 Accessories: Bella Bleu DSP, Designer Brads, 1/2" Circle, Large Oval, Scallop Oval and Eyelet Border Punches, Stampin' Dimensionals, Silver Embossing Powder and small red stickers. Thanks for having a peep! Enjoy the rest of the week. CONGRATULATIONS to Shelagh Moore who was randomly chosen to win a $20 SU gift voucher. 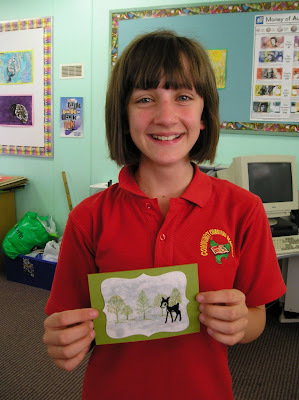 Shelagh chose the second 'Polished Stone' card (pictured). Thanks to everyone who entered my first little competition. Humble beginnings .. and more ideas are rattling around in my head for future ones. I've even signed up with 'Mr. Linky' so I can upload your images. I know I should be getting ready for my Christmas Card Making Nights, but I just couldn't resist the temptation to have a play with Keesh's Colour Challenge for the week. 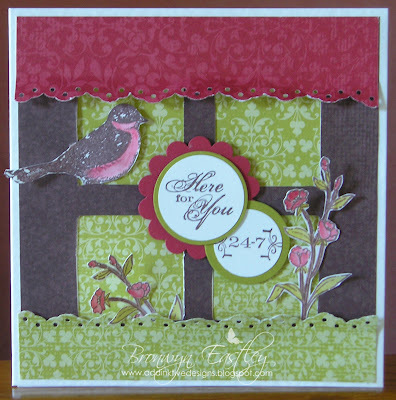 I hadn't done an Inkspiration's colour challenge and the combo was perfect for hubby's wedding anniversary card. I also got to ink up two stamps that I've had in my stash, for the first time!! So, all in all, it was a very worthwhile little digression from all things 'Christmas'. The challenge was to use the above combination of colours. I should mention, that THE anniversary (December 8th) is kind of a SPECIAL one, as it will be our 25th! Gasp! I hear you say, you don't look old enough to be married that long! 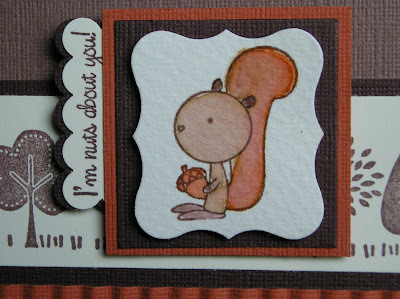 Gee.. thanks and it's absolutely true that, "I'm still nuts about him". Thanks for stopping by and enjoy the week ahead! 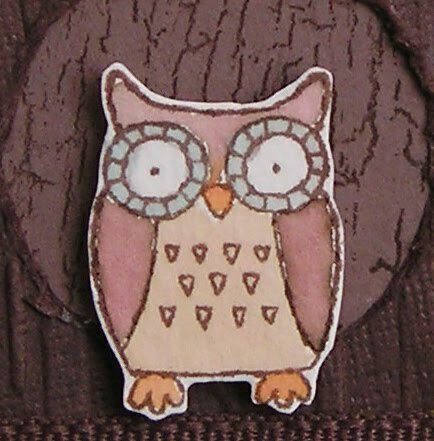 PS: This was featured on the Late Night Stampers' Blog Finds for the Day, November 9th 2009. While browsing the web last night, I came across a site called, 'Stampin' Sisters for Christ'. They had put out a challenge to make a card etc. based on a Bible verse. This week's verse comes from Deuteronomy 31:8. So, I've used the 'Friends 24-7 stamp' set to highlight that God is with us 24-7, through the good times and the bad. 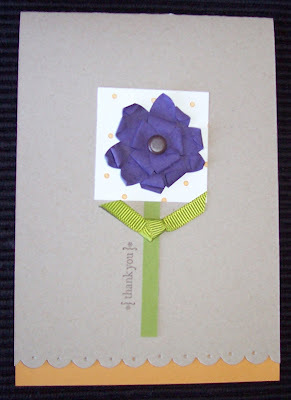 I have used Bella Rose DSP and the flowers were coloured using a blender pen dipped straight into the Stampin' Pad. You can view the details of the challenge here. It's beginning to look a lot like Christmas! I had a lot of fun putting this one together and was inspired by a card I saw here. Well, that's number 2 all sorted. Hope it brings you a little joy! My first Christmas Card Making Workshop is only a week away and I thought I'd show you the first, in a series of 5, that we'll be making. 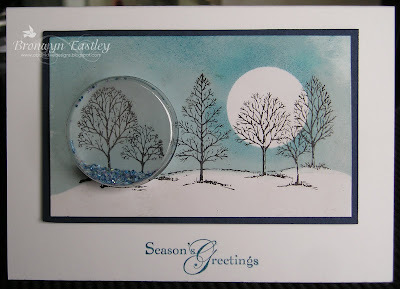 This uses the absolutely gorgeous 'Winter Post' stamp set and is inspired by the tag pictured on page 25 of the Australian SU Idea Book and Catalogue. .... or place it onto some cardstock to make a cute Christmas card! I'm pretty excited about spending a couple of evenings stamping with friends. The Rumpus Room has been taken over and it is now my Stamping Room! and ... yes, there are still spots available if you'd like to come along. 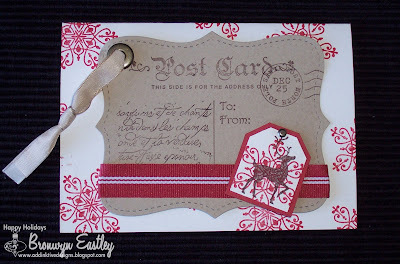 Accessories: Tag and Small Tag Punches, Top Note Pattern, Jumbo Eyelets (Antique Brass), Vintage Brads, Kraft Taffeta Ribbon, Riding Hood Red Striped Grosgrain Ribbon, Crop-A-Dile and Stampin' Dimensionals. My lovely friend, Leonie, was kind enough to take some snapshots of me, at the recent Hobart Field Training Event. Thought I'd post these to prove that I actually did get to appear very official and provide a five minute demonstration on the polished stone technique! Here I am with a bottle of alcohol in my hand (the rubbing variety) ready to soak the cotton wool ball, before adding drops of the Old Olive and Not Quite Navy re-inkers. Up on the big screen you can see that I have randomly placed some drops of gold ink onto the glossy white cardstock, ready for me to dab the inked cotton wool ball onto. Once the ink dries, it needs to be sprayed with a finishing sealer. It's a simple, but very effective technique and you can view the samples that I made here. While you're there browsing, don't forget to enter the competition. All you have to do is leave a comment telling me which card you like the best and why. You have until next Tuesday, 10th November, to go into the draw to win a $20 SU Voucher! 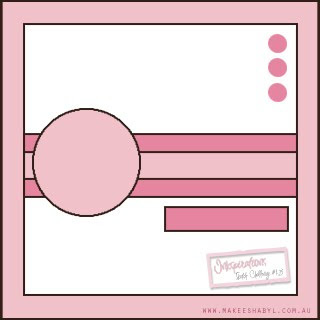 I love browsing at Makeesha Byl's website and have wanted to play along with one of her challenges for ages. So.. here's the first sketch challenge for Inkspirations. 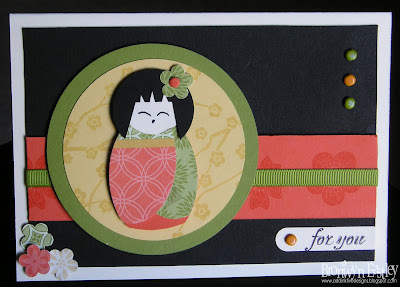 I made this little Japanese Girl for my Swaps at the recent Field Training Night in Hobart. Thought it might be fun to keep the general colour scheme etc. but change the layout for this sketch challenge. You can view all the Swaps that I made here. Thought it was about time that I had another go at a Sweet Sunday Sketch Challenge. Here it is using the gorgeous set, called Razzle Dazzle, which will be released in Australia with the launch of the new Summer Mini Catalogue, on December 1st. This is a gorgeous stamp set that you can use your Stampin' Write Markers with for the feature stamp and it also makes a great background! 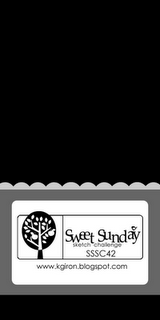 Here's Karen Giron's Sweet Sunday Sketch for the Week. Here's a sneak peek at one of the cute new stamp sets that will be released, in the new Summer Mini Catalogue, on the 1st December. It's called 'Hello Again'. These are the samples that we got to make in Hobart. I love the colour combination, the cute little box , the stamped envelope for an extra touch and the gorgeous ribbons! Here's a close up of the 'Retro Remix' standard wheel, which was rolled onto the top of the little box. I realised when I came home, that the semi-circle in the box opening was not centred properly. Maybe ... just maybe, I wasn't able to concentrate because I was about to do a demo straight after the Make 'n' Take session! I ended up bringing the kits home and finishing them off when I was in a better frame of mind! 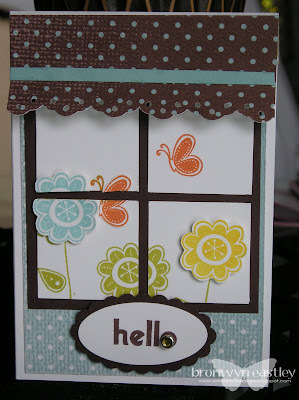 I have been wanting to make a cute window card using a square punch for ages. I've seen a few done with the Cheep Talk stamp set. The note card (available in a pack of 20), was just the right size for this layout. Here, I have combined my two favourite accessories from the Spring Mini, the Parisian Breeze DSP and the Scallop Oval Punch, with the new Summer stamp set. It will be sad not to be able to purchase any more of that gorgeous paper as the items in the Spring Mini Catalogue are only available until the end of November. If there's anything you'd like, please contact me. Outside orders are always welcome.